Well, Keith is back and his very first tweet makes it abundantly clear that he was indeed suspended over evolution. "And yet it moves" — the famous words, written in Italian, of astronomer Galileo Galilei, who was dragged in front of the Catholic church and banished to a life of house arrest for suggesting that the Earth moves around the Sun. After his sentencing, Galileo was said to have stomped the ground and looked up at the sky, uttering the words, "And yet it moves," in defiance of what religious officials had forced him to accept under threat of violence. Fortunately, there is a silver lining. No matter how much these science deniers wish it wasn't the case, the truth is still out there. The Earth still moves. In the early drafts of Don't Let Us Win Tonight, the quote from Curt Schilling talking about his November 2003 Thanksgiving meetings with Larry Lucchino, Theo Epstein, and Jed Hoyer was part of the off-season prologue in the front part of the book - and was much longer. It was eventually shortened and moved to before Game 1 of the 2004 ALCS. When I found out about the Diamondbacks wanting to trade me, there were only two places I had interest in going: Philadelphia and New York. I found out through the grapevine that Ruben Amaro, Sr., had no interest in bringing me back to Philly, so I figured if I was going to leave Arizona, it would be for New York and New York only. We were actually doing a charity event at my house in Arizona for the SHADE Foundation and Mr. Colangelo and Joe Garagiola, Jr., were both at the house. 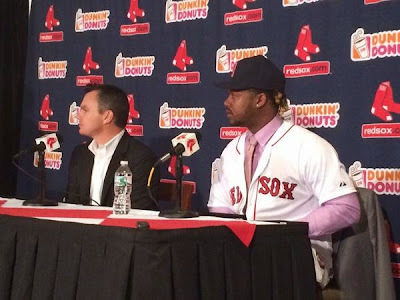 Sometime that day, I heard that Tito was interviewing in Boston. During the night, there was some small talk with Joe and I said, "Listen, I heard that Tito was interviewing in Boston. If that actually happens, I would probably be interested in the Red Sox as well." He left and went to talk to Mr. Colangelo and came back about ten minutes later and said, "Actually, we have a deal in principle with the Red Sox already. They're going to fly out and they'll be here on Wednesday to talk to you." I was like, ". . . OK." This was Monday or Tuesday; Thanksgiving was Thursday. It happened that fast. I told Shonda, "They're not kidding. Boston's a legitimate possibility." Then the whirlwind started. Off the top of my head, I had pitched in Fenway before. After I'd become established I came there in interleague play one time. I don't remember the game. I threw like eight innings and gave up seven or eight runs one night and ended up getting the win. I remember the park feeling incredibly small. Being a fly-ball pitcher, that's generally not a good mix. Theo Epstein and Jed Hoyer came to the house the night before the meeting and dropped off a note from Bill James, with a statistical breakdown on how I would have fared in Fenway given my spray charts and hitting charts from the year before. And Fenway was actually better than Bank One. That was the first time that I realized that Bank One truly was a hitter's park. That was clearly part of the sales pitch. We started off the discussions and it was Larry Lucchino, Jed, and Theo. That was Wednesday. We talked and made some overtures about potential salary and things like that. There was concern about salary and the fact that they weren't going to be able to pay me more than Pedro. I didn't care about that. I was going to be paid well no matter what. Larry actually made the first offer. I remember him pushing over a document and it said "Plan A" on it, or something like that. I looked at the numbers for about five seconds and I said, "Oh, that's nice. Can I see Plan B?" Theo kind of chuckled and Larry looked at me like, "We really don't have . . ." and it was kind of awkward. We broke for a little while and we came back and they made another offer and it was not even remotely do-able. We talked, and kept talking, and talked into the evening. I remember calling Joe Garagiola that evening and saying, "I don't think this is going to work and I don't want you to be pissed if I end up coming back there to Arizona." He said, "If the worst case is that you're our #2 next year, I can deal with that." He was very cool. It made it very easy for me. He was awesome about it. In the background, at the same time, I got a call from a person locally who was well-connected with the Yankees and that person informed me that Brian [Cashman] was going to be calling me in the near future and that they were interested. Very interested. I ended up having a couple of conversations along those lines, in which I was told if I let a certain window run out, I could basically fill out a blank check. Which was obviously interesting. That was a nice fallback, if it didn't work out with the Red Sox. The problem was that at this point, I had sat with Theo and Jed long enough to really like both of them, and so I started to kind of want to go to Boston. Wednesday night, we were disappointed. My wife and I were talking and we really didn't think that this was going to work because they were nowhere near the number that we needed to be at. Larry left. We talked to Theo and Jed that night and found out that they had nowhere to go for Thanksgiving, so we invited them over. They were adamantly trying to say "no" [to decline the invitation] and I said, "These contract discussions are completely off if you guys don't show up." So they came over. Jed was really sick that day and we spent most of the day watching football, talking. Not about baseball. Just talking. I really liked both of them and I could see that from an analytical standpoint Theo and I were birds of a feather. He believed in the things I believed in to be a good pitcher. We believed in data and stats the same way. There was a lot of common ground. We talked through the night. We parted ways on Thursday and felt this was not going to happen. That's when I talked to Joe [Garagiola] and said I don't see this as a possibility. But then, as I understand it, Theo made a call to John [Henry] and Tom [Werner] and spoke to them about it. I think that I had given them a ballpark number that I was going to need. The big number for them was the AAV – the average annual value of the contract. They needed it to be under X and in my mind – given where I sat in the marketplace – I was already taking an under-market contract. Which was fine, again, but I wasn't going to take too under-market, just because I knew that I was going to have a lot of bearing on the free-agency that winter, on players that were out in the market. I had a number in mind, but they weren't anywhere near it. Theo went home and got Mr. Henry to change his mind and then came back and asked if they could talk. At the same time, I was talking to the other party and we were setting up a potential Saturday get-together as soon as the Red Sox window of opportunity ran out. They came back over and put an offer on the table and the one thing about Theo and Jed – I think from both ends – when it was Theo and Jed and I – there was no . . . we weren't negotiating to get to a better number. I told them, "This is my number. I'm not trying to milk any of this or any of that. This is my number. If this number isn't OK, then I understand, but it's just not going to happen." They came back and worked around it and that was when I asked about the incentives and the clause with the World Series bonus. I guess by the end of the day, I knew that was why they were there. They weren't there to trade for me to pitch and come in and help the team. They were there to trade for me to come in and help the team win a World Series. It was a real unique moment, I think. They were sitting in the living room and – people think this was orchestrated, but it wasn't – we were in the room where my World Series trophy was sitting. It was actually sitting in the background between Larry and Theo, and I said, "Listen, I know for a fact that from a financial perspective, you guys can go wherever you need to go. I guess what you have to figure out is what kind of value you place on that" – and I pointed to the World Series trophy. "You're bringing me there to win one of those. And I've done it against the team you can't get past. I know there's some value there. You guys are going to have to decide if it's worth it." And ultimately they did. 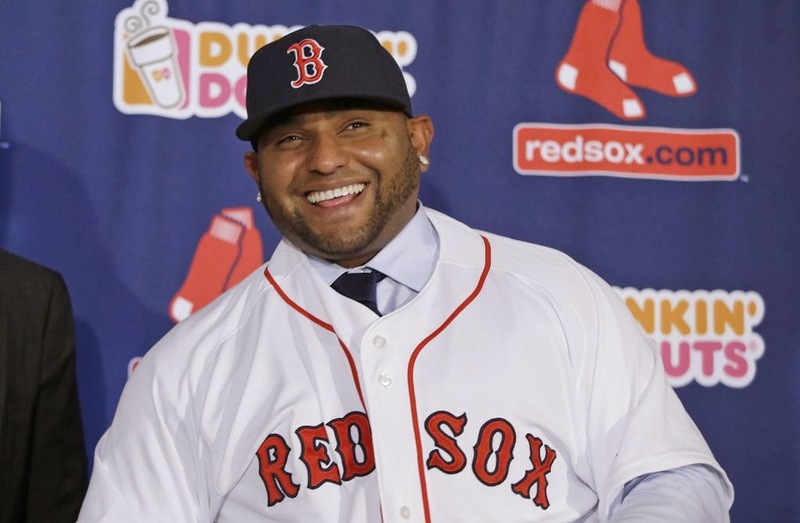 The Red Sox announced the acquisition of new third baseman Pablo Sandoval this afternoon. I want a new challenge. I made that choice to be here in Boston because I need a new challenge; I need to lead that team, with the legacy they have here, the fan support they have here. That's why I had to make sure that I made the right decision. It took me a long time. Now I'm here to help them be in the postseason again. There are reports that the Red Sox are close to signing (or have already signed) free agents Pablo Sandoval and Hanley Ramirez. Jake Wesley reports that Sandoval's deal is 5/102. Ken Rosenthal tweets: "Source: Hanley Ramirez headed to Boston tomorrow to finalize deal with #RedSox." That deal is believed to be around 5/90. Heavy-tweetin' ESPN baseball writer Keith Law has been noticeably silent for the last couple of days. That's no coincidence — he's been given a Twitter timeout by ESPN, and we're told that it's for loudly and repeatedly defending Charles Darwin from transitional fossil Curt Schilling, his Bristol colleague. Schilling, the former pitcher who rejoined ESPN as a baseball analyst in September after eight months away to deal with mouth cancer, took to Twitter on Nov. 12 to rail against evolution and in favor of creationism. I'm a little scared to look too closely at this "debate". Giancarlo Stanton and the Miami Marlins agreed to a 13-year contract worth $325 million. It also includes an early opt-out clause. $25/year seems reasonable for Stanton, but ... 13 years? Stanton turned 25 ten days ago, so this will take him through his age-38 season. ... Business Insider calls it "a genius move". Curt Schilling shared a post-surgery picture of his stitched-up right ankle - from the glorious 2004 postseason - on his Twitter account yesterday. It's a bit more graphic than the swollen ankle shot featured in Don't Let Us Win Tonight! Welcome back, Slappy! Let the circus begin. Gordon Edes has information on the Red Sox's 2015 spring training schedule. Opening Day is against the Phillies on Monday, April 6 in Philadelphia.